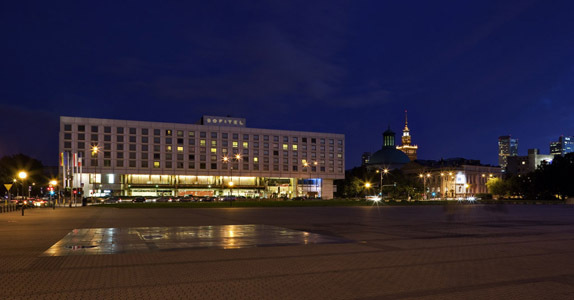 The luxurious Sofitel Warsaw Victoria invites you to visit the historical and cultural capital of the Polish. The hotel is totally devoted to well-being of its guests. His quiet, elegant, classically furnished rooms and suites look great eighteenth-century Saxon Gardens and the famous Pilsudski Square. The hotel boasts an excellent location in the heart of Warsaw's Old Town, near the Grand Theatre, the Royal Castle and the most fashionable boutiques in the city. Victoria offers 290 rooms and 53 suites, including the Presidential Suite. With a modern leisure center with swimming pool, sauna and gym, and 14 multi-purpose meeting rooms, the hotel is the ideal place to relax and organize any type of meeting. The Sofitel Victoria Warsaw, is located in the centre of the city close to many famous architectural monuments as well as next to the financial and commercial centre of the capital. From the windows of the hotel there is a beautiful view of the Pilsudski square surrounded by the Saxon Gardens, Grand Opera and historic Royal Tract. There are 341 luxurious rooms (including 11 suites) on seven floors of the Victoria hotel. We can choose Superior, Deluxe or Executive room type. In some of the rooms the King bed will make the stay even more comfortable. Those air-conditioned rooms are decorated in traditional style; one might even say the style is dignified. Soft, pastel walls, paintings and stylish lamps create a friendly, home-like atmosphere. The Internet, safe, TV-sat, additional pay-TV is another side of story - the modern equipment of the rooms. Furthermore, there is a telephone installed in the bathroom and the sound system. Thanks to its presence we can enjoy the sounds of our favorite music even while we bathe. The guests in Victoria Hotel will surely appreciate the large beds with special mattress that will make your relaxation even more enjoyable. The designer of the working place should also be praised - a big, bright and very comfortable desk with a telephone equipped answering machine and Internet connection is a professional working space for every businessman. The mini-bar, tea and coffee set and room service available 24 hours a day provide various possibilities of relaxation in your room. The rooms are surely very nice and comfortable, however do not fully reflect the 5* standard of the hotel. They are more like 4,5 star - rooms. There are three rooms prepared and designed to meet the needs of the disabled. There are also three lifts taking the guests to the higher floors of the hotel. We will not find any stairs on the way to the reception, restaurant or bar. Half of the rooms are for the non-smokers. Surrounding the guests with art, beauty and richness of shades and tastes is what the hotel has always been aiming for. To get to the "Canaletto" restaurant (what a meaningful name) you have to take a walk through the corridors enjoying the graphics of the modern artists. On the way you will pass the "Hetmanska" restaurant decorated with wood. It is prepared for big conference groups. "Canaletto" attracts the guests with its rich, stylish décor, pastel colors and warm interiors. The menu consists of the meals from the international cuisine and a choice of traditional Polish meals. The chef recommends a crunchy duck in rucola and apples (47PLN) and a banana tatin in caramel sauce as a dessert. If you are looking for relaxing atmosphere - Zielony Bar (The Green Bar) is a place to go. The grass green, sea green, bottle green walls - the various shades of the color will calm you down and the comfortable armchairs (green of course) and gentle light will let you enjoy your tea, coffee or drink till 1:30 am. You will spend your time as nicely in the hotel's cocktail bar, where you can spend your time over drink enjoying the view of Saski Garden. Victoria has a long tradition of organizing conferences - the choice of conference rooms of different type and equipment make it possible to organize any kind of meeting; workshops in small groups or large banquets for hundreds of people. There are small rooms, e.g. Salon Senatorski for up to 10 people and large spaces with Ball Room of 800m2. The modern conference-banquet center consists of 14 rooms equipped with air-conditioning.